Four player co-op, teleportation, possibly other rogue things. Have you ever wondered what happens after you beat the final boss? After the credits roll and everybody lives happily ever after? You're about to find out. Roving Rogue from PadaOne Games begins where most stories end. You play as Kurt, a short rogue who can teleport short distances, and it's your job to find the beginning. With some friends, of course. 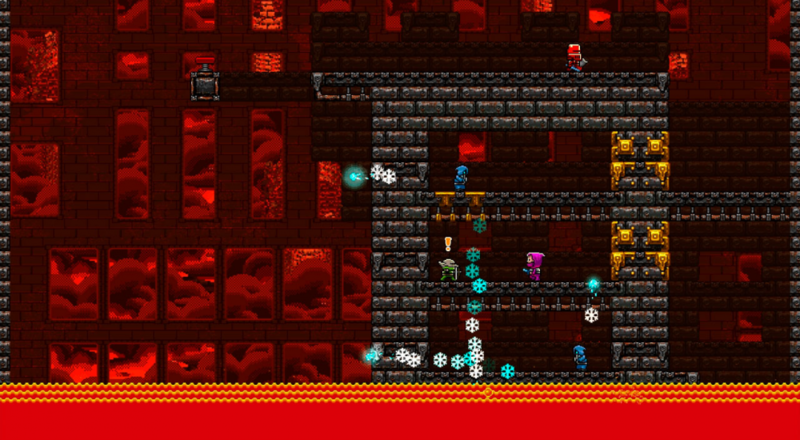 Roving Rogue plays like a nice old school platform game. It uses the protagonist's teleportation technique to create some interesting spins on classic favorites, allowing you to "jump" from wall to wall, pop across barriers, and avoid enemies. The story unfolds as you play, gradually unveiling the details as to why this rogue wandered into this dungeon. He can't remember, so somebody might as well learn his tale. Co-op in Roving Rogue lets up to four local players join in the teleportation frenzy. Interactions are kept at a minimum, but you can still mess with your friends' day by triggering switches early and the like. Not that you'd want to do that, of course. You're a good cooperative player, aren't you? Aren't you?! Roving Rogue is packed with 42 levels and ready to please. Great for an indulgence in nostalgia with some friends. Pick it up on the Wii U eShop for $7.99. Page created in 1.7027 seconds.